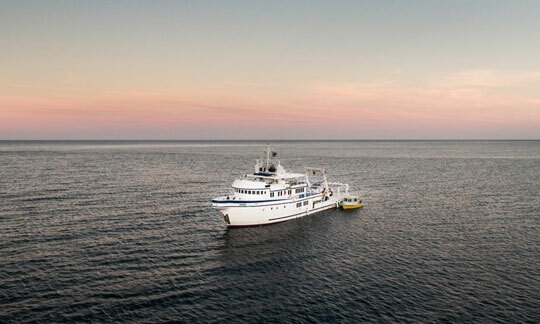 Built in 2008, MV Argo is from the well-respected Undersea Hunter fleet and, as with its sister ships, is a combination of expedition vessel and luxury steel hull yacht. 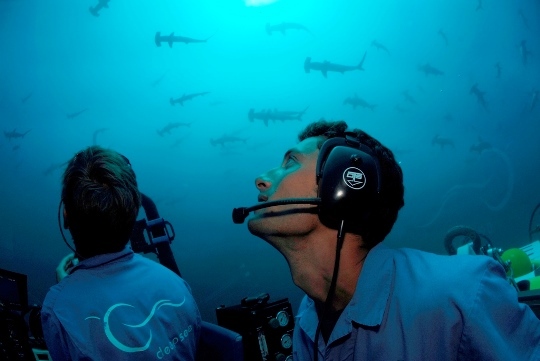 Up to 16 guests can be accommodated on board and are catered to by 9 crew members, with a vast amount of combined local experience of Cocos diving cruises. 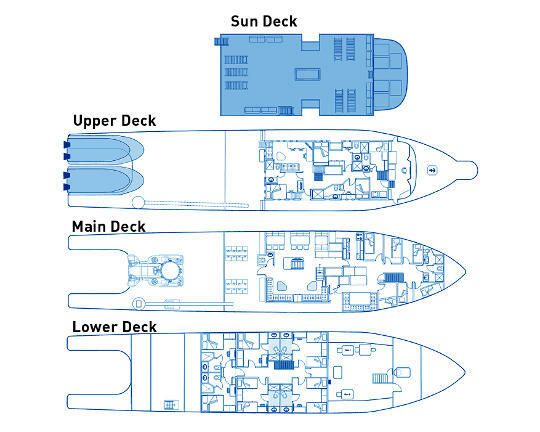 With a length of 129ft (39m) and a beam of 26ft (8m), there is a considerable amount of space on board, so you can always find a quiet spot during your cruise. 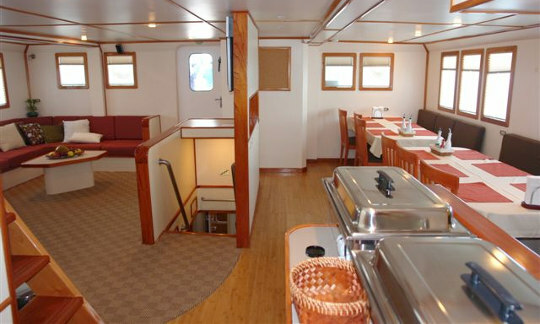 Socializing tends to take place in the air conditioned saloon and dining area on the main deck. The saloon features full audio-visual entertainment facilities as well as board games to make the crossings seem to pass quickly. 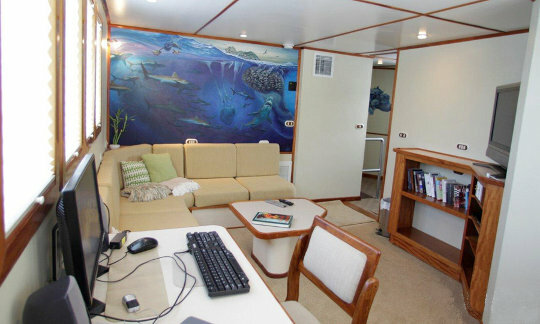 Argo sports a unique custom-painted art décor interior throughout the vessel. You may even have the chance to experience a once-in-a-lifetime dive up to a depth of 985ft (300m) on the DeepSee Submersible that is housed on MV Argo. 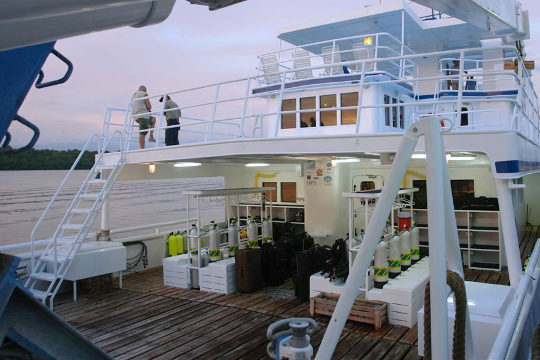 Nitrox is free of charge and used widely by Argo guests who also benefit from the spacious and well-equipped dive deck. Your in-water safety is taken seriously at this remote destination on Argo. 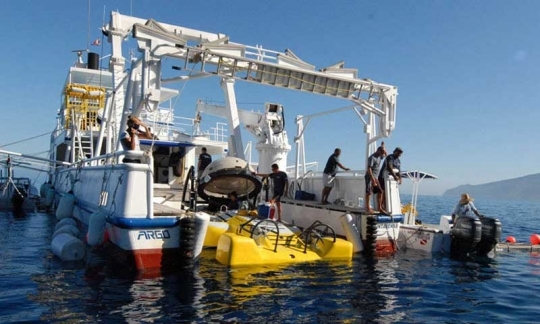 Each diver is issued with a personal position indicating beacon, clipped to their BCD, to reduce the possibility of losing anyone, and all scuba diving is conducted from superior twin engined fiberglass skiffs, with roofs to shelter you from the Cocos elements. The extra large cabins are double or twin suites and all are fitted with air-conditioning, TV, VCR player and en-suite hot water bathroom facilities. 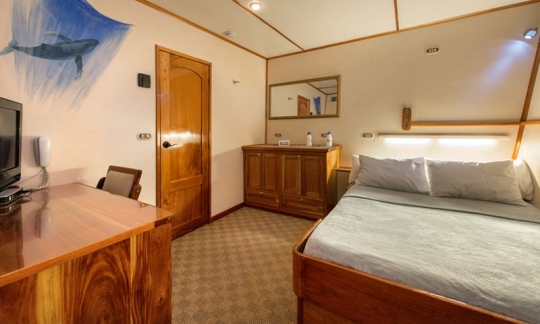 Unusually, the suites also have satellite phone communication as well as the ability to receive personal E-mail via the boat's server and wifi system. The boat also offers free guest laundry service during the cruise. 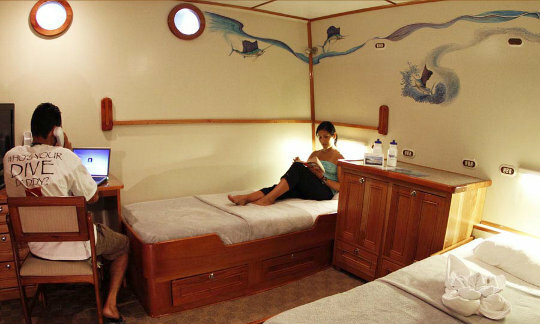 Its custom-built stabilizing system, mounted on outriggers, makes for peaceful sleeping on this cruise. 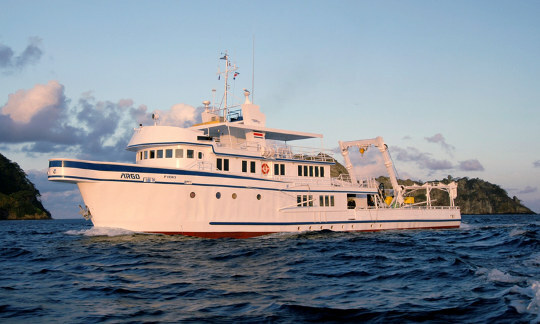 The MV Argo manages to be a comfortable home from home for serious Cocos Island divers having serious fun! Cruise price per person includes: Cabin accommodation with air-conditioning, breakfast, lunch, dinner, snacks, driking water, soft drinks, hot drinks, dives (as detailed in the trips above), experienced English-speaking divemaster(s) (max number of divers per DM is 9), tanks, weights, weightbelt, nitrox fills for enriched air certified divers, return land transfer from San Jose to Punt Arenas. personal diver locator (EPIRB). 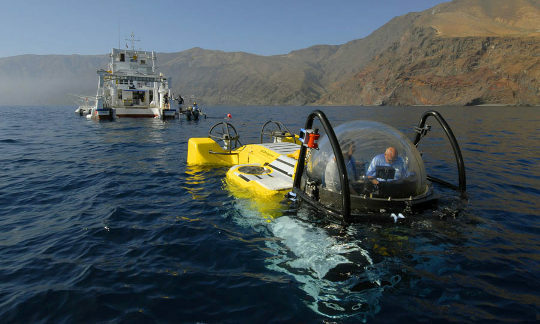 Optional extras: Alcoholic drinks, torches, dive computer, Deep Sea submersible dives, subject to availability, depth range from 100 to 300m, prices range from US$ 1 450 to US$ 1 850. Unless otherwise stated, all the listed items need to be paid on arrival. How to get there: MV Argo departs from Puntarenas. Guests fly into Costa Rica and overnight in San Jose. You will be transferred from your hotel in San Jose to Puntarenas, provided you stay in a recommended hotel. For more information see our Costa Rica travel information section. Note: Departure times from Puntarenas vary according to the tides, between 10:00 and 16:00 hrs. You will be informed of your pick-up time from San Jose. The last dive of the trip will be on the second last day of the trip. Please wait at least 18 hours before flying after diving. Dive clubs and group discounts: Pay for 12 guests and 2 additional persons can join the cruise free of charge (total 14 or more guests). 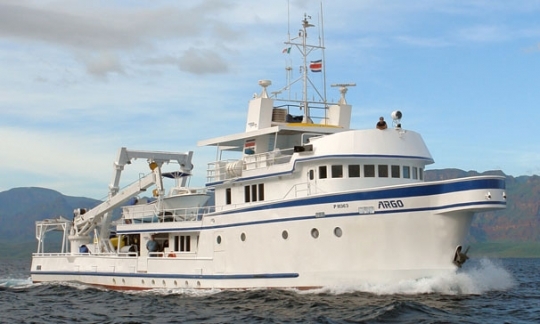 Whole boat charter rate (per night): 10 nights US$ 6,954. These prices assume 14 guests. For prices for larger groups (up to 19 guests) please check with us. 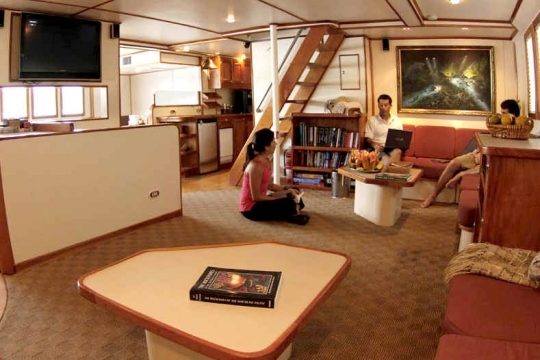 MV Argo has 8 x 100ft² large suites, all with private en-suite bathrooms. 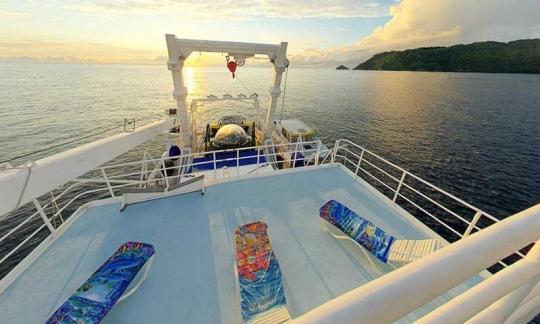 There are 5 double cabins with queen-size beds, 2 on the upper deck and 3 on the lower deck. 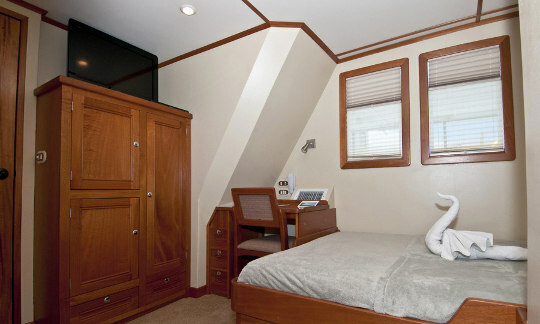 The 3 twin cabins with 2 single beds and are located on the lower deck. All cabins are the same price. 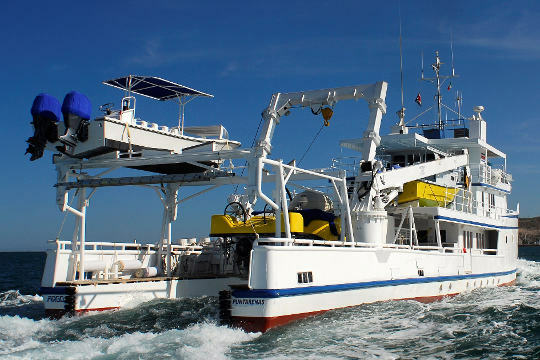 All the diving at Cocos with Argo is made from the 2 x 26ft (8m) fiberglass dive tenders. The tenders have 115 HP twin engines and are built for 10 divers each. Each has a roof shade, camera storage area, emergency oxygen, radio, first aid kit, rugged exit ladder, and deck lights for night dives. There is no need to assemble or load your scuba equipment after each dive as your gear stays on the tender at all times. 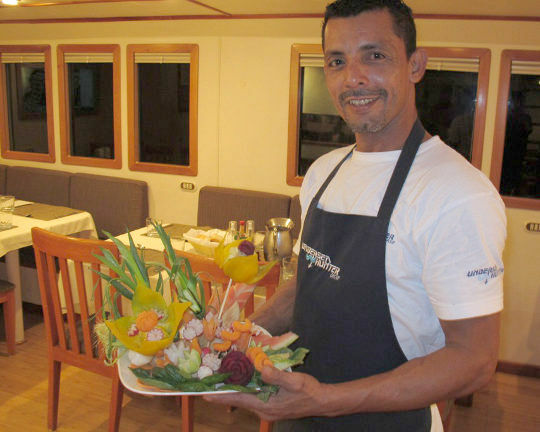 Meals are varied, abundant and well balanced on board MV Argo. Ingredients include fresh tropical fruit, salads, fish, chicken, beef, all prepared in a variety of ways by the 2 on-board chefs. All meals are served buffet style and you can look forward to a range of international cuisine as well as some interesting Costa Rican specialties. International, Italian and local cuisine is served. Buffet-style meals consist of breakfast, lunch and dinner with snacks in-between. Coffee, tea, drinking water, soft drinks, snacks and a beer after your last dive are provided free of charge. Wine and other beers are available for purchase on board. All dietary requirements including vegetarian can be catered for - please send advanced notice. Catering begins with lunch on the day of check-in.